Bread and butter-Oh I have to live off one thing for the rest of my life? Fine, give me bread and butter. What goes better with soup than some B&B? Nothing…except a glass of wine..maybe…depends on the day. Making a huge pot of soup also eases the pain of cooking meals each night of the week, so on a typical Sunday I prepare a large pot and then have lunch and/or dinner for the next few days. As winter quickly turns to patio weather spring, and PWS turns to bikini clad summer, I’ve started to choose lighter recipes for our weekly meals. While at the grocery store a couple weeks ago I picked up the Jan/Feb copy of Food Network Magazine which featured “Yep, it’s Light!! 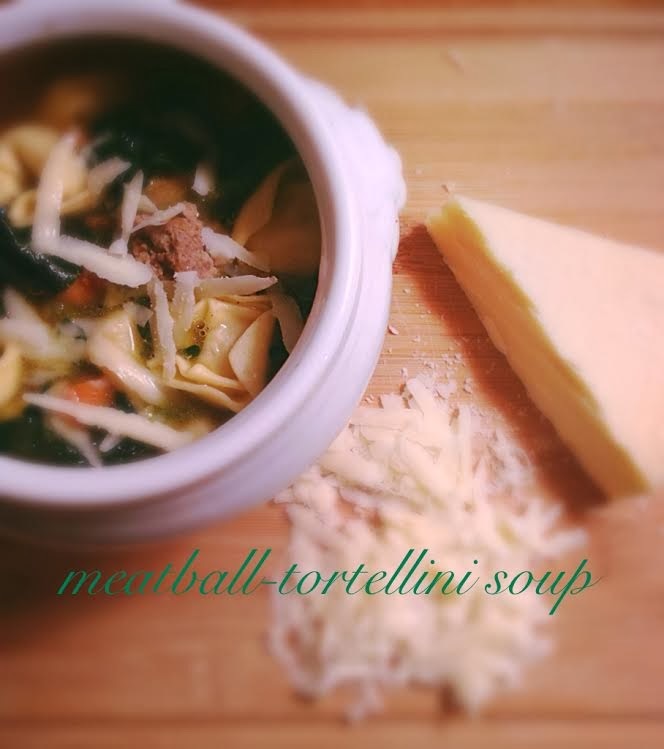 !”, which is not at all what caught my eye, it was the delicious pot of soup on the cover, Meatball-Tortellini Soup. Rarely do I come across a soup recipe that I don’t feel the need to touch up by adding different broths, spices, sauces etc. This recipe was incredibly simple, inexpensive, fun to make, and DELICIOUS. I substituted spinach for kale since I had an abundance in my refrigerator and it was great. I also added freshly grated Parmesan cheese since I had a block on hand, not necessary, but oh-so good. Other than that, I made ZERO changes to the recipe. The craziest part? I didn’t even feel the need to pair it with B&B! Baby steps…baby steps towards springtime patio margaritas in a maxi dress and my little black bikini.